The full title of this Haaretz article is “Hiking in Abraham’s footsteps, from Turkey to the Holy Land.” Sounds incredible at the moment. To hike this complete trail from Haran (Genesis 12:4) to Beersheba (Genesis 21:31) (not to mention the trip to Egypt) requires travel in Turkey, Syria, Jordan, Israel, and the Palestinian Authority (West Bank). Among the leaders back of the concept is David Landis and his wife Anna Dintaman, developers of the Jesus Trail from Nazareth to the Sea of Galilee. 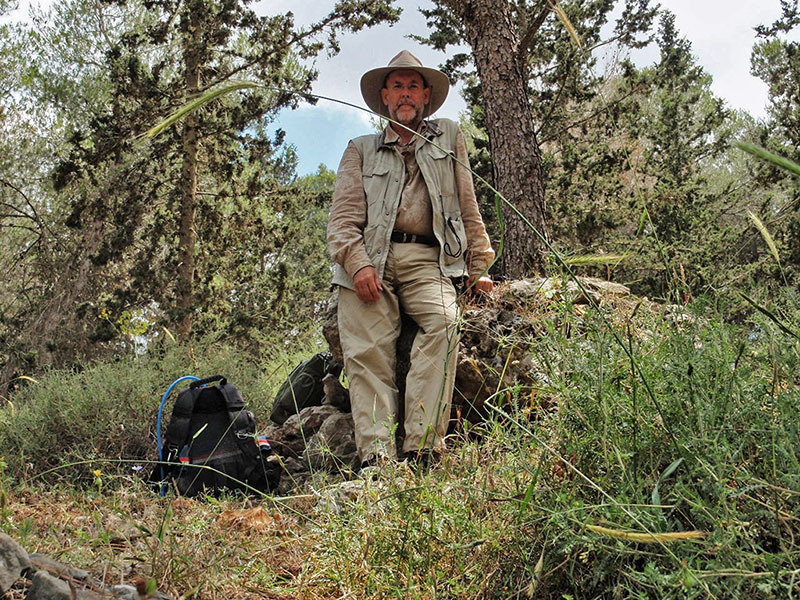 Their book, Hiking the Jesus Trail and Other Biblical Walks in the Galilee , is worthwhile even for those who do not plan to walk the trail. Larry Haverstock walked the Jesus Trail in 2011. I see that Larry’s posts about the experience is still available on his blog. See the 3rd Journey. You will find some fascinating stories along with beautiful photos you may never see from a bus or car. Larry Haverstock in the Zippori Forest north of Nazareth. The link to the Haaretz article may be accessed here. In order to read the full article you must register for free access to 10 articles a month. Don’t expect to walk the Abraham Path from Haran (in Turkey) to Beersheva [Beersheba], but you might be able to walk small portions of the trail everywhere except the part going through Syria. There are many hiking trails in Israel, but most of these avoid contact with the Palestinian Authority. The new plan seeks to involve the local people in the development of facilities useful to hikers. If you like hiking, or if you appreciate the geography of the Bible lands you will probably enjoy the article. Abraham Path has a nice web site with maps and photos here. I don’t know what, if any, relationship there is between the Abraham Path and the Patriarchs Way, a trail that is said to run from Beersheba to Nazareth. The defacing of the sign to eradicate the Arabic indicates one of the problems either trail might face. One often sees this sort of thing on signs pointing to Christian sites. 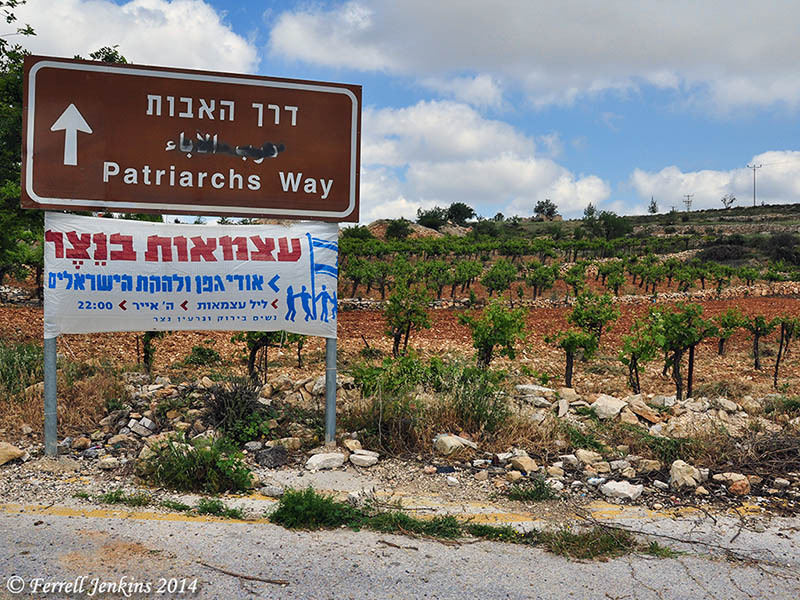 Sign pointing to Patriarchs Way off Hebron Road (Hwy. 60) south of Bethlehem . Photo by Ferrell Jenkins. Walk the Land : A Journey on Foot through Israel , by Judith Galblum Pex, is a fascinating account of a couple who walked the Israel Trail from Eilat to Dan. This entry was posted in Bible Lands, Bible Places, Bible Study, blog, Books, Culture, Egypt, Israel, Jordan, Old Testament, Photography, Travel, Turkey and tagged Hiking, Palestinian Authority, Syria, West Bank. Bookmark the permalink.